Two bands of birds set into arches. Two birds are under each arch, facing outwards, with a tree at the centre between them. The colours of the birds vary between red, blue, and yellow. Designs featuring birds were popular for decorating textiles and other media, including ceramics, glass, woodwork and ivories, during the period when Egypt was ruled by the Fatimid dynasty. Attractive and colourful bird patterns had already been worked in tapestry weaving on Coptic textiles and this weaving technique continued after the arrival of Islam in the mid-7th century. In this linear design the artist has arranged pairs of birds on either side of stylised plants and trees that form an arcade. In the same fashion trees or tall plants between such creatures as lions or falcons appear on luxury silk fabrics made in Spain, Iran, and Mesopotamia thought to date from the 10th to 12th centuries. Here the semi-naturalistic pose of the birds and the highly stylised foliage make an interesting contrast of styles. On a similar fragment in the collection, pairs of birds perch on trees whose tops are almost triangular in shape and whose trunks are decorated with S scrolls. Radiocarbon dating has given this latter piece an age range of 990±60 so it is probable that both are from the early Fatimid period. Split stitch has been chosen to work the embroideries in every case, with the addition of small couched lines on this one. 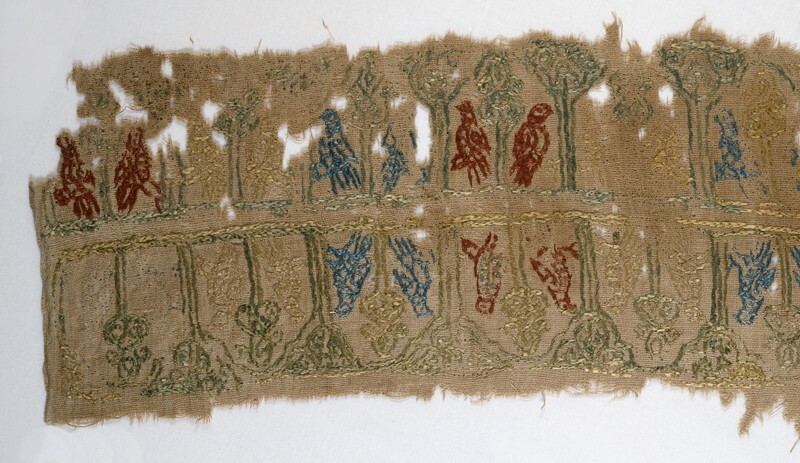 Although examples of embroidery made in Egypt before the middle of the 9th century are extremely rare, there are some worked in split stitch described as dating from 7th or 8th century. 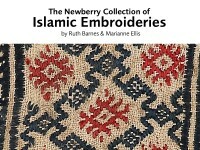 However the number of them is so small that it is impossible to know if there was a continuous tradition of figural embroidery worked in this manner.